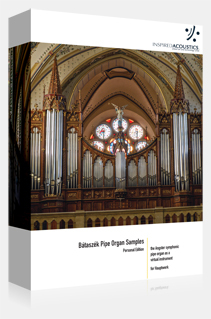 Description: Bátaszék Pipe Organ Samples (BAT) is a symphonic virtual pipe organ chromatically sampled stop-by-stop, located in the Church of Blessed Virgin Mary Assumed Into Heaven in Bátaszék, Hungary. The organ was originally built by Angster in 1902 and was restored by Varga. The 2-manuals and pedal instrument has 36 stops. The virtual Bátaszék Pipe Organ financially supports the original instrument.